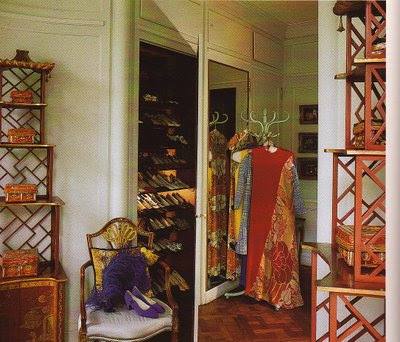 In honor of the upcoming anniversary of the 113th birthday of the Duchess of Windsor on June 19, the photo above and just below are of her stunning Chinese Chippendale closet. 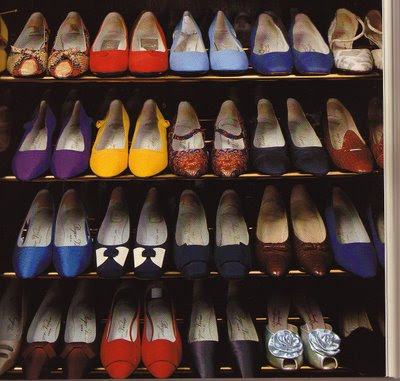 The recreation was done by Sothebys for their auction of the contents of this famous closet in 1998 found via Brilliant Asylum. I have just recently converted one of my extra bedrooms into a dressing room/walk-in closet, a very popular trend now, so here are some ideas for creating your own Chinoiserie closet. Maybe these ideas will motivate you to take that little room you don't really use and turn it in to a fitting home for your clothes and accessories. A little note-aren't these shoes mostly by Roger Vivier to die for? 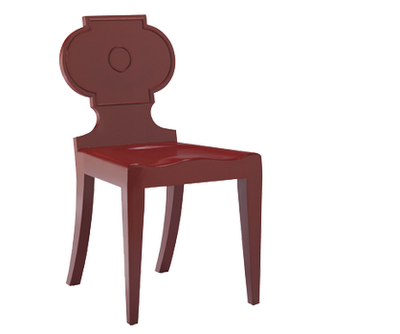 Wonderful red lacquer chair from the new and quite affordable Baker Studio line. 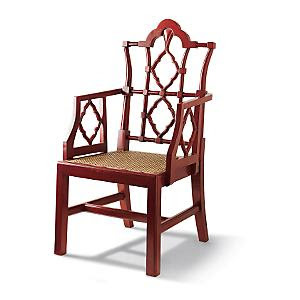 A great red lacquer fretwork chair from Gumps for only $395. 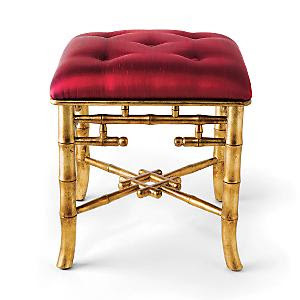 I think this Palace Stool from Gumps for only $298 is perfect. Gorgeous pagoda etagere by Anne Selke. 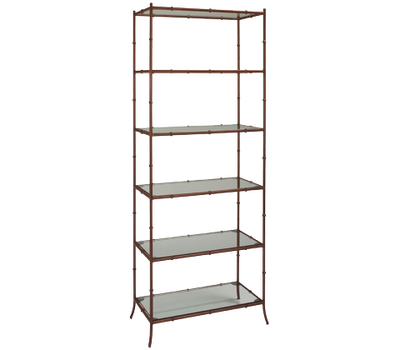 Bamboo etagere from the Baker Studio line. Wonderful gilt bamboo etagere for only $399 from The Mermaid Hut. 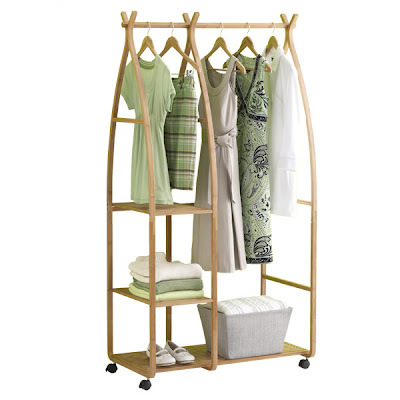 Another "in" look is garment racks-this bamboo version from The Container Store is ideal at only $129. That is the nicest garment rack I've seen! I've tried a few of these in the past (small apartments and DC's notorious lack of proper closets) and they're all either ugly, flimsy, or both. The little shelves are impressive too. The Baker Studio line is fabulous. I've got to go over to the Baker dealer here in town and check it out in person. Also, I agree with SF -- that garment rack is fabulous! SF-Lots of mags are showing garment racks left out on display-this one is great looking. Averill-You need to check out their entire line of Baker Studio-it is gorgeous and well priced. Sarah-It's very well priced. I love the look of gold bamboo. i love it - an entire blog devoted to chinoiserie!! amazing!! i just did a bedroom makeover post on my blog today...it has just a hint of your favorite style in it! Mademoiselle Frou-Frou-Love your blog. I will add it both blog rolls. Thanks for stopping by! Wow -- I cannot explain the joy this post just brought me. 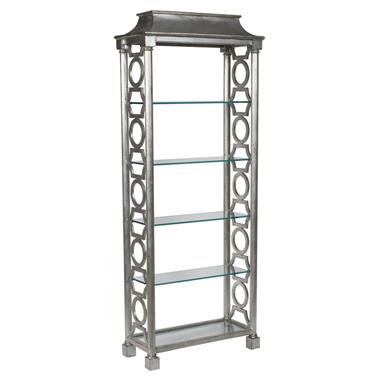 I have spent the entire week searching for a pagoda etagere just like the one from the Container Store. And $129?? Thank you, thank you! la-A fascinating story. Thanks for stopping by. Jenn-Another DC Design blogger-great. You have to join our group! 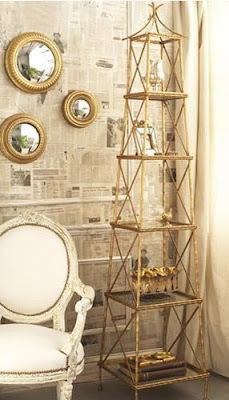 Hope you figured this out-the gold bamboo etagere is at the Mermaid Hut. They have a whole line of gold bamboo-go check it out-thanks for stopping by. I love this post -and great suggestions!! A seperate formal dining room, a butler's pantry and a dressing room are MUSTS for anyplace I live after my tiny little shoebox I'm in now LOL. And wasn't she just the most fascinating woman with great taste? I have about 6 books about her, each one more interesting than the other. Stefan-I love your place, and I would love to see what you would do in a large place. Some Chinoiserie, I hope. She was fascinating. We'll have to toast her Friday-her birthday. Stefan-I grew up in an ultra modern house-all teak and rosewood and leather and modern art. My grandmother had a red lacquer secretary just as you describe that I adored and my parents hated. They would never have allowed it in their house. Just found your blog! Adore anything chinoiserie. I actually have a little post scheduled for tomorrow with the gumps stool...so glam! Jill-I will definitely check it out-thanks for stopping by. I just found your site and this thread. I know it's been posted for over 4 years now, but do you have any idea what happened to the Mermaid hut? I am desperately trying to find that beautiful gilt bamboo etagere you posted. Please help! Thank you. It's Two's Company - check Amazon, etc.